I think Amazon might be waging a war on trees. I love Amazon - don't get me wrong. But the amount of packaging and size of the boxes they use to send things always baffles me. I often wonder if there isn't just a fulfillment room full of disenchanted gnomes somewhere who shake their fists at forests and laugh maniacally as they use an 18x20 cardboard box to send a package of pacifiers. Lately, we seem to have accumulated a rather significant number of Amazon boxes, due to the fact that we used that site for our baby registry. Being the insane person I am, I started looking at packaging and going "Rather than just throwing them out, what could I DO with these?" As it turns out, they were the perfect solution to another problem I was having. Underneath the crib we have in our still-in-progress nursery is a little slip of space that's about 4 1/2 inches high. 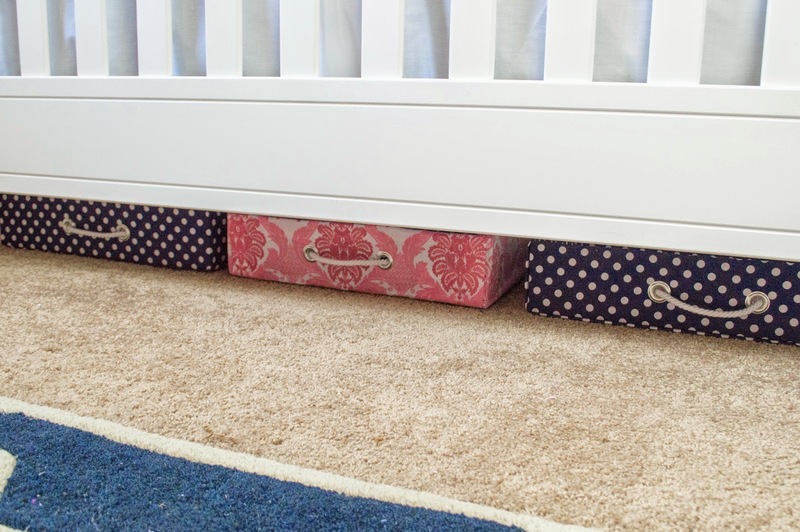 As our nursery is already rather small, it's important to utilize every square inch for storage, and this little slot could be perfectly useful except that nearly all under-bed storage options are way too tall for the incredibly narrow space. As it turns out, some of the Amazon boxes are perfectly sized to slide underneath - which is awesome - except they're not exactly attractive, and the crib skirt doesn't cover them. Which is when I decided to turn them into something much prettier and totally useful. 1. Carefully cut off the box flaps. 2. Cut a long strip of fabric to cover the outside and inside of one wall, leaving an inch or two of overlap on all sides. Repeat for the opposite wall. 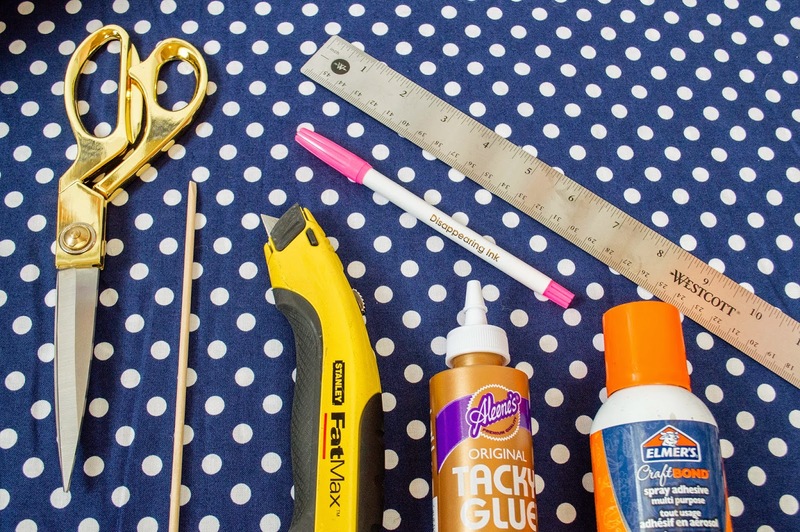 Use spray adhesive to attach fabric, smoothing as you go. 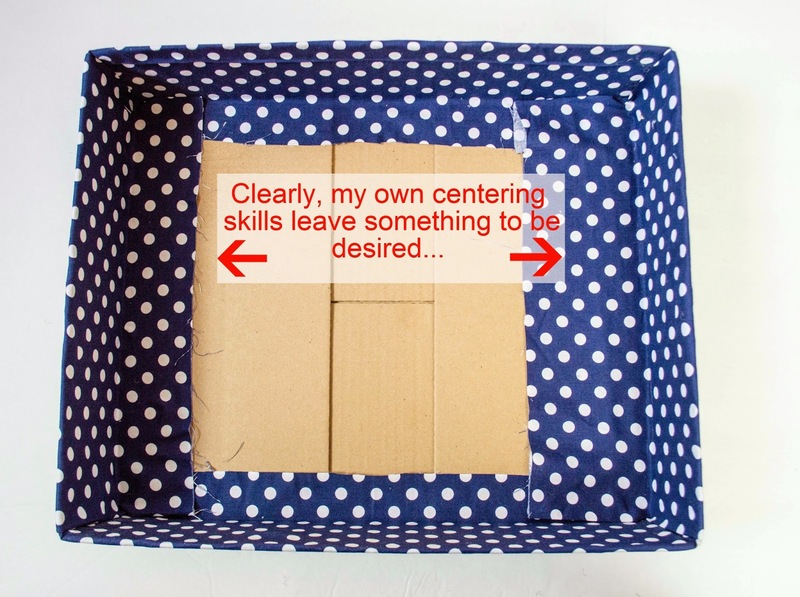 Adhere overlap fabric to inside and outside bottom of box. For example: For the A Sides, I cut a piece of fabric that was 8 inches high and 22-24 inches long. 3. 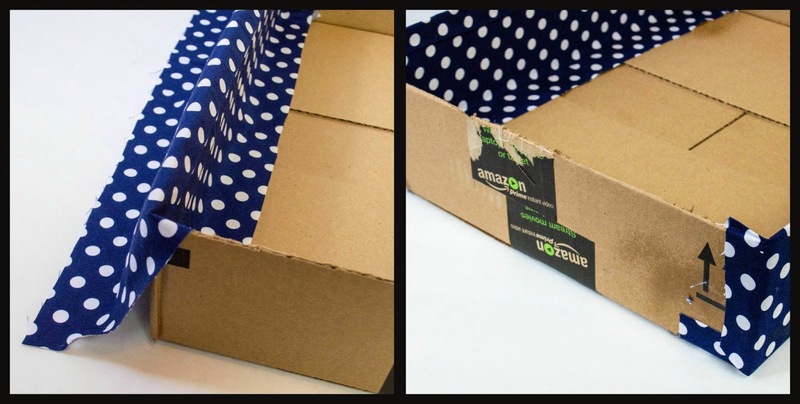 Measure and cut one additional piece of fabric to cover the outside bottom of box, and outside and inside of each remaining sides, with 2 inches of overlap on all sides. For example: To cover the bottom outside of the box (C - not shown) and the outside and inside of sides B, I cut a piece of fabric that was 19 inches wide and 40 inches long. 4. Fold two inches on each of the long sides in toward the center and iron to create a crease. 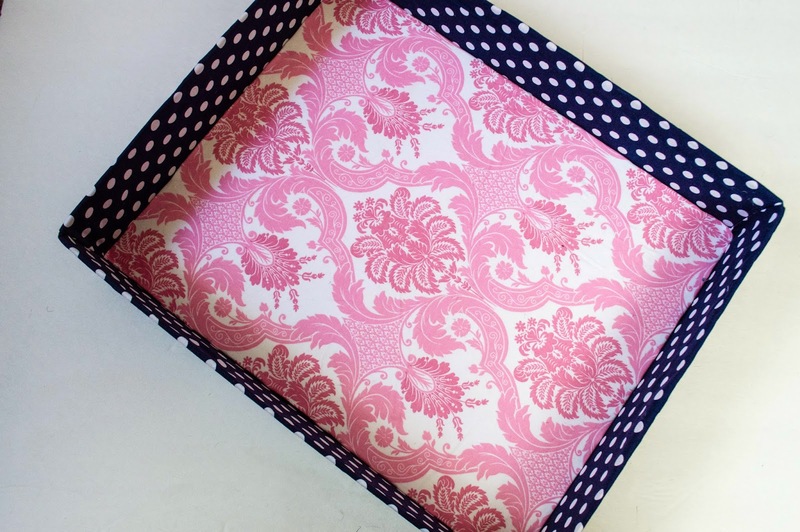 The idea is to make a long piece of fabric with neat edges that will perfectly cover the bottom of the box. For example: On my box, I folded and ironed 2 inches from each of the A Sides to create a perfectly even and "hemmed" 15" wide piece of fabric. The 40" do not need ironed and the ends can remain unfinished. 5. 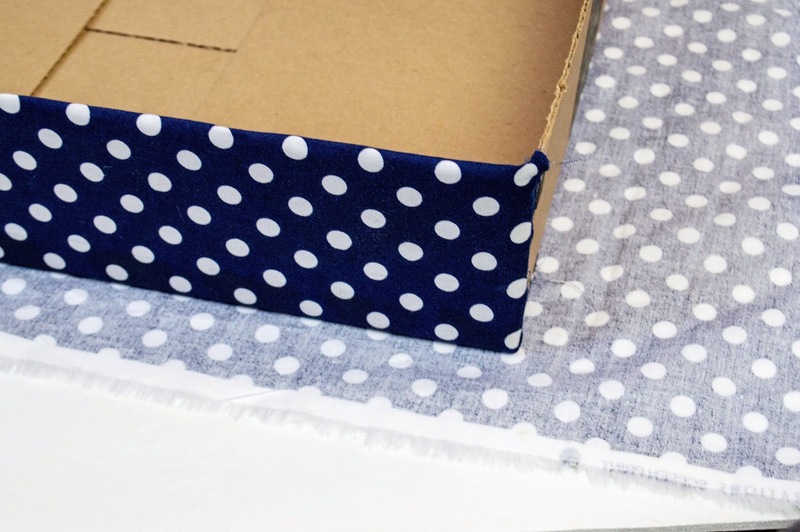 Spray the bottom of the box with adhesive and carefully center the fabric, smoothing as you work your way outward (**Make sure the ends are centered as well!). Continue gluing the fabric to the outside & inside of each side and, finally, to the bottom of the inside. When finished, the bottom and all sides should be covered with fabric. The cardboard and unfinished edges of the fabric will still be visible on the inside bottom of the box. 6. 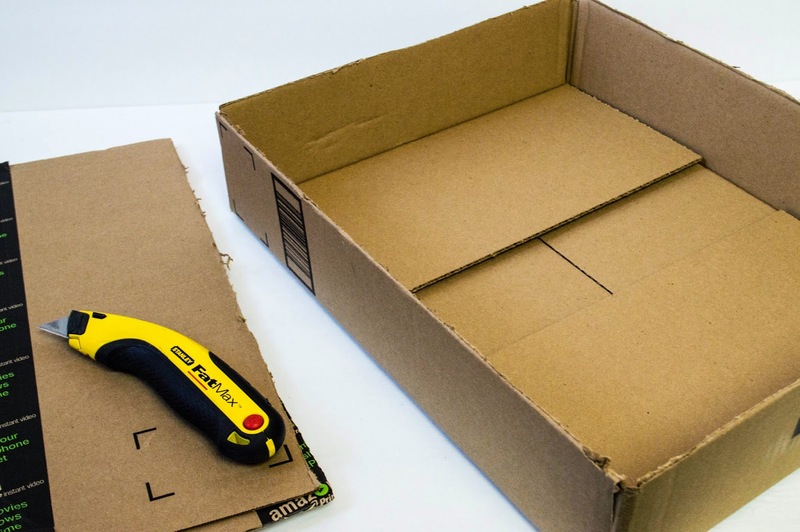 Measure and cut a piece of foam core to fit snugly inside the fabric covered box. Measure and cut a piece of coordinating fabric to cover one side of the foam core with an inch or two of overlap on all sides. Attach fabric to foam core, smoothing as you go and affixing the overlap to the opposite side. 7. Slip the fabric covered insert into the box to cover all unfinished edges. Woot! You have a fabric covered box! 1. Measure and mark your grommet location 2. 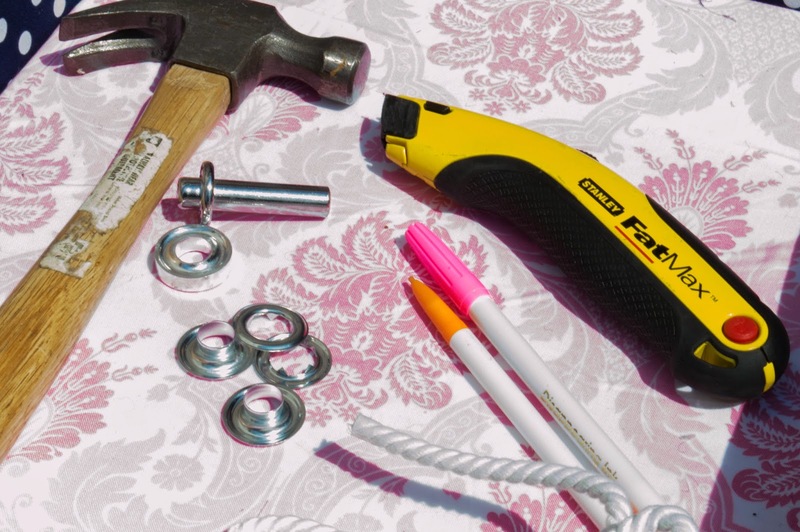 Use scissors/craft knife to create a hole big enough for the grommet to fit through. 3. 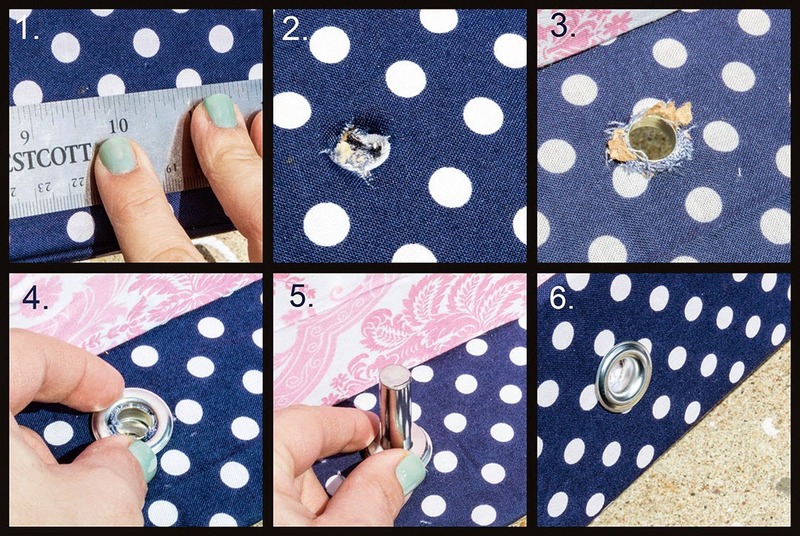 Slide grommet through hole in box and fabric 4. Place washer on the opposite side of the grommet (don't worry if it doesn't look pretty - it will!) 5. Center grommet on anvil and insert flaring tool into washer. Hammer until fastened together (It's quite fun!) 6. Admire your handiwork. Man, are you awesome. 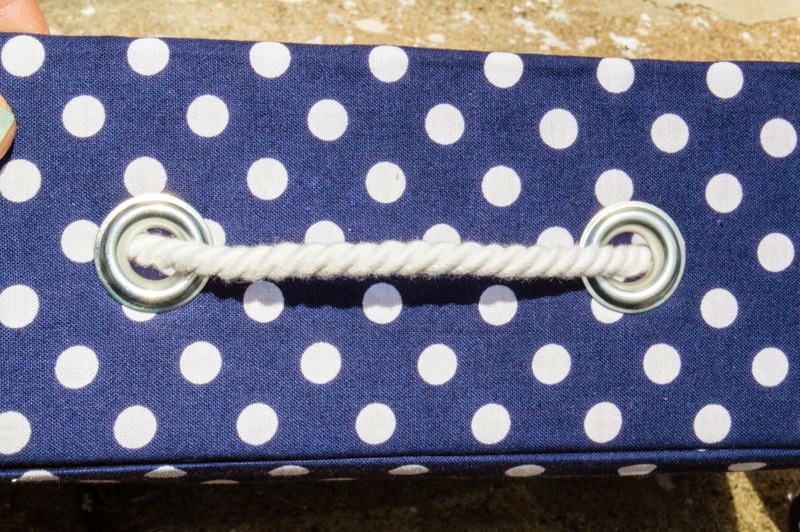 Handles: Slide rope through grommets and knot on the inside to create handles. Tough stuff, I know. Sliders and Such: Add self-adhesive sliders for ease of use, or bookplate labels to mark your shtuff. I have to say, I LOVE how mine turned out. 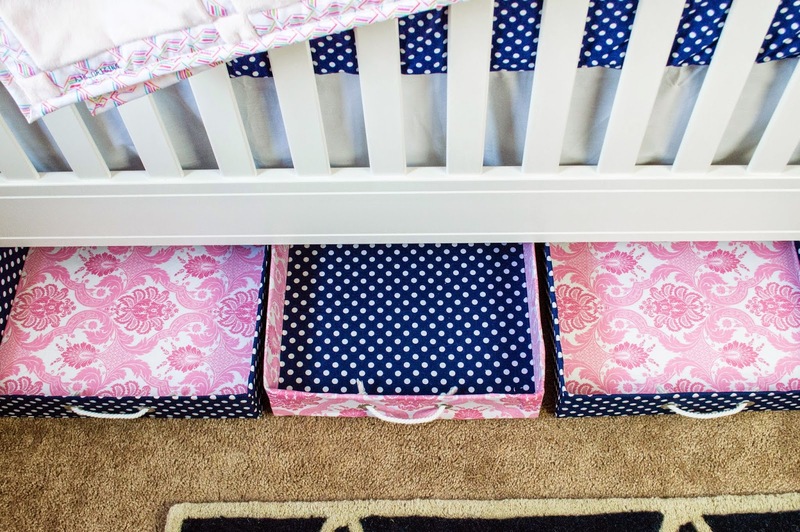 I did three coordinating bins and they fit perfectly under the crib. I love that they add to the decor rather than taking away from it - all while giving me extra storage for clothes, toys and supplies. I'm also kinda thrilled with the cost. I had most of the supplies on hand and only spent about $9 total on some additional fabric from Walmart. 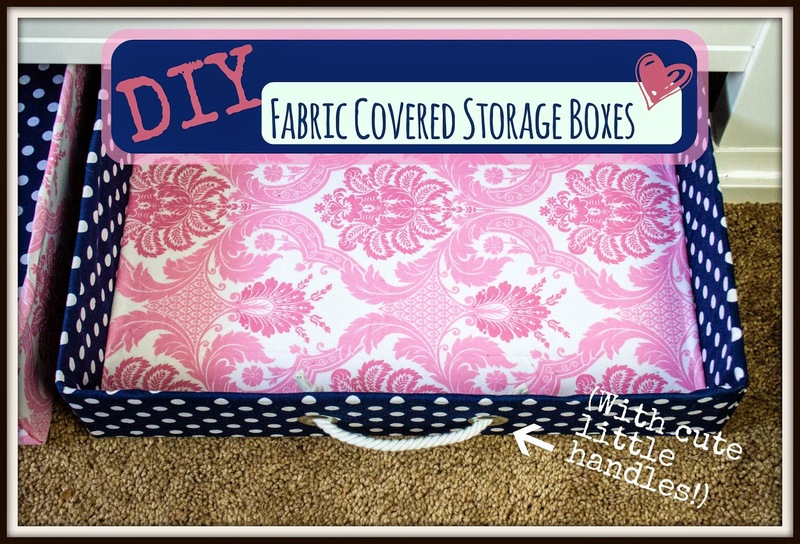 (PB Teen has similar storage boxes for almost $30 each). And I was able to create the exact size and shape I wanted! I'm definitely going to make a few more of these for other places in the house when I have time! It's kind of nice thinking I'm fighting the good fight against those Amazon.com tree-hating fulfillment gnomes out there. I mean, what nobler cause is there? Planning to try this project? I'd love to see pics on how yours turn out!! I'm always looking for additional inspiration! Awesome job. They look great!